Abstract : Illuminated manuscripts of medieval music contain rich decorations in addition to handwritten neumatic notation. Our project with composer Philippe Leroux investigates the use of such handwritten symbols during the composition of his piece Quid sit musicus. 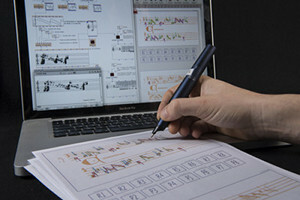 We introduce pOM, an interactive paper application and a library for the OpenMusic computer-aided composition environment which links pen gestures over an old manuscript to compositional processes. The paper interface analyzes the stroke while writing and transmits several features to reactive programs in OpenMusic. pOM allows the composer to define his own functions and get direct musical feedback from pen interactions.